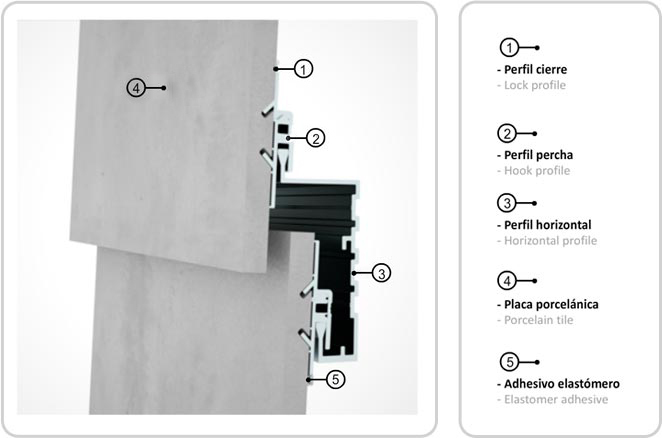 The mixed concealed longitudinal Rediwa C.A.T 6 fastening system is a product of the progress made by our Technical Department, which considers Innovation as a means of setting the standards in terms of the ventilated facade sector. In this mixed concealed fastening system (mechanical and chemical), the ceramic tiles are placed in an oblique manner, resulting in a façade with a flaky shape, which offers a fully innovative perception in comparison to more traditional systems. A couple of longitudinal grooves on the upper and lower back of the ceramic tile and an MS adhesive putty, allow a hanger and enclosing profiles that are hung to the horizontal structure to be attached, as in the Rediwa C.A.T 1 system. It also provides for the replacement, if necessary, of just one piece or the adjustment of piece by piece because of imbalances.